Visiting a traditional Chinese doctor can go one of two ways. You will either have your tongue inspected, your pulse taken in six different ways and leave with a bundle of herbs, or you’ll find yourself gazing at the ceiling as acupuncture needles connected by a large battery twitch away in your forehead like crazed antennae. I jest – there are definitely more treatment options than that – but I’ve personally experienced both. 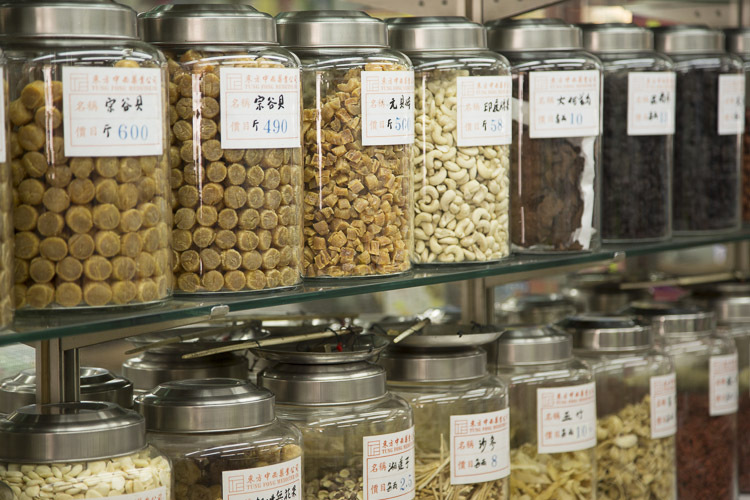 Traditional Chinese medicine definitely subscribes to the view that the more bitter the medicine, the better it works. Happily, Chinese food therapy – using food and diet to improve health and prevent disease – is far more palatable. All foods are considered either yin (cooling) or yang (heating). The ideal is to achieve balance between the two, with imbalances resulting in illness. Sometimes it’s easy to guess whether a food will be cooling or heating: Chilli pepper? Heating. Cucumber? Cooling. But the designation is often less intuitive. An astonished Chinese friend once caught me eating oranges while suffering from a hideous cold – oranges are heating, and eating them when you have a cold or flu (a hot kind of illness) is thought to make you feel worse rather than better. 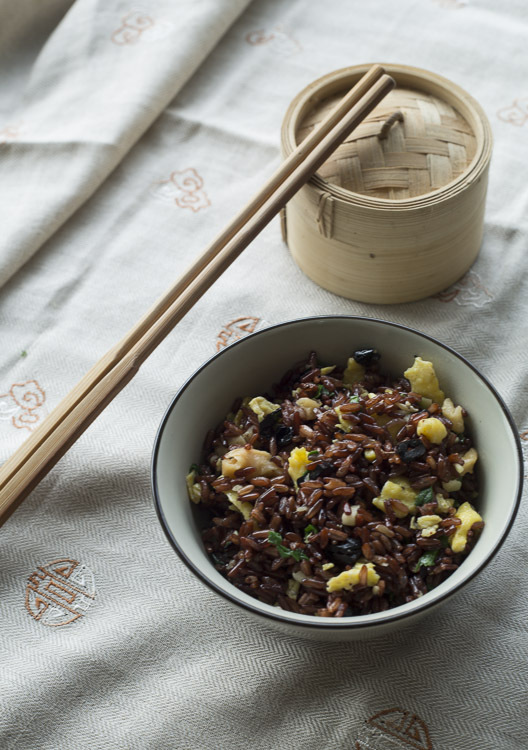 Another name for the dish below is “pregnant lady fried rice” (大肚婆炒饭, dà dù pó chǎofàn). In China, it is one of the first dishes served to new mothers. Giving birth is an extremely cooling event, and ginger helps to warm everything back up. 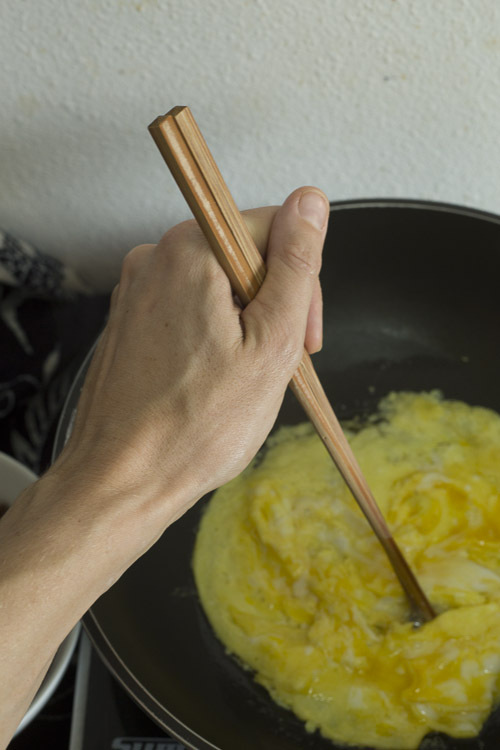 Crack the eggs into a bowl and beat briefly to combine. 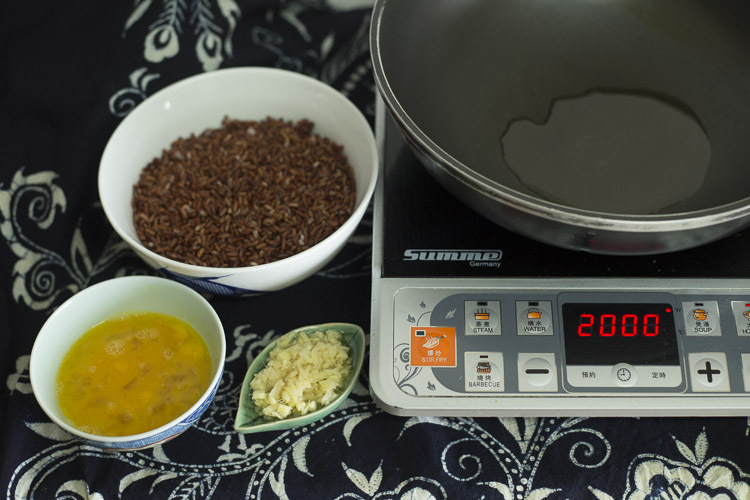 Set the eggs, rice and other ingredients next to your stove while heating the oil over a high heat. Add the ginger to the pan and let it sizzle until it becomes fragrant. Then add the preserved turnip and olives, if you’re using them, and fry for a minute or two before swirling the eggs into the pan and stir-frying until 80% cooked. Then add the rice and spring onions, frying for a few more minutes and breaking up any large pieces of egg. Taste and adjust the seasoning – you may wish to add more salt – then serve. 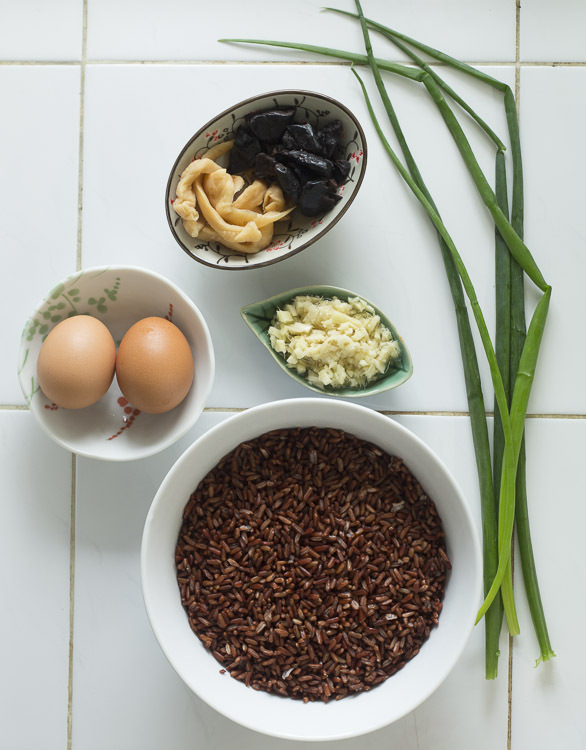 I used red rice, because it’s what we had at home, but white and brown rice work equally well – the only stipulation is that it is cooked and cold. Leftover rice is perfect. Traditionally, this dish includes the Chinese olives and preserved turnip shown above. Chinese olives are odd little things – squashed and preserved, they have a faintly medicinal taste overlaying their oliviness – an acquired taste, so feel free to omit. The preserved turnip adds a more pleasing saltiness and crunch, but is also strictly optional. One of my local restaurants serves a version of this dish where the rice comes fried with ginger and eggs, and then has finely chopped lettuce stirred through just before serving, which adds a lovely crunch and slight juiciness to the final dish – try it!